The new Church of Scientology Melbourne Ideal Organisation was dedicated January 29, 2011, in ceremonies attended by more than 2,000 Scientologists and their guests. Mr. David Miscavige, Chairman of the Board of Religious Technology Center and ecclesiastical leader of the Scientology religion was joined by civic leaders and government officials to commemorate the opening of the first Ideal Church of Scientology in Australia. Melbourne native and award-winning singer and songwriter, Kate Ceberano, performed her original composition “This Song is You.” The song was written in celebration of the opening of the new Church of Scientology of Melbourne, honouring the heritage of the city and all of Australia. Kate Ceberano—Melbourne native and award-winning singer and songwriter—performs “This Song is You.” Written in honour of the occasion, the song likewise celebrates all that Australia holds dear. Mr. David Miscavige, Chairman of the Board of Religious Technology Center and ecclesiastical leader of the Scientology religion cut the celebratory ribbon on the new Church of Scientology of Melbourne. He was joined by Church executives and parishioners, and special guests: Lord Mayor of Melbourne, the Honourable Robert Doyle; Moonee Valley City Councillor Paul Giuliano; Shadow Minister for Tourism and Major Events, the Honourable Justin Madden; Emeritus Professor of Sociology at Monash University, Professor Gary Bouma; award-winning singer and songwriter Kate Ceberano; and Former Indigenous Person of the Year, Uncle Bob Randall. Mr. David Miscavige, Chairman of the Board of Religious Technology Center and ecclesiastical leader of the Scientology religion, joined by the Lord Mayor of Melbourne, the Honourable Robert Doyle and Melbourne native and award-winning singer and songwriter, Kate Ceberano, at the dedication of the new Church of Scientology of Melbourne. Mr. David Miscavige, Chairman of the Board of Religious Technology Center and ecclesiastical leader of the Scientology religion, dedicated the new Church of Scientology of Melbourne. Joining him were (left to right): Shadow Minister for Tourism and Major Events, the Honourable Justin Madden; Former Indigenous Person of the Year and traditional owner of Uluru, Uncle Bob Randall; Lord Mayor of Melbourne, the Right Honourable Robert Doyle; Moonee Valley City Councillor, Paul Giuliano; and Emeritus Professor of Sociology at Monash University, Professor Gary Bouma. Mr. David Miscavige, Chairman of the Board of Religious Technology Center and ecclesiastical leader of the Scientology religion with Melbourne native and award-winning singer and songwriter, Kate Ceberano and the extended Ceberano family, which includes three generations of Australian Scientologists. Mr. David Miscavige, Chairman of the Board of Religious Technology Center and ecclesiastical leader of the Scientology religion with Founding Australian Scientologists who spearheaded Melbourne’s drive for an Ideal Church of Scientology. Ecclesiastical leader of the Scientology religion, Mr. David Miscavige, with leading Humanitarians of the new Church of Scientology of Melbourne. On the occasion of the Grand Opening of the new Church of Scientology of Melbourne, Mr. David Miscavige, Chairman of the Board Religious Technology Center and ecclesiastical leader of the religion, acknowledges Humanitarians of the Church of Scientology of Melbourne. Thousands of Scientologists and guests toured the new Church of Scientology of Melbourne. The Church’s Public Information Displays offer more than 450 informational films which provide an introduction to every aspect of Dianetics and Scientology and the many humanitarian programs sponsored by the Church. The new Church of Scientology of Melbourne stands at Ascot Vale, Melbourne. This landmark building is now home to the oldest Scientology Church in Australia and the first Ideal Scientology Organisation to open beneath the Southern Cross. The Church of Scientology of Melbourne’s reception extends a welcome to everyone. Here, visitors will find an array of introductory books presenting the fundamental beliefs and practices of the religion. The Church of Scientology of Melbourne’s Public Information Centre offers informational films which provide an introduction to Dianetics and Scientology, as well as the Church’s many humanitarian and community outreach programmes. Here, too, is a biographical exhibit on the life and legacy of Founder, L. Ron Hubbard. All congregational gatherings are convened in the new Church of Scientology of Melbourne’s Chapel—Weddings, Naming Ceremonies (christenings), and, of course, Sunday Services. The Chapel further serves as a venue for a host of community events and functions. 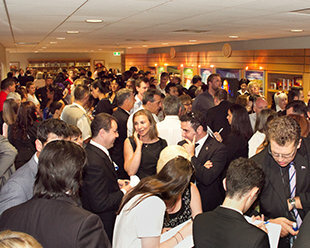 A full wing of the new Church of Scientology of Melbourne is devoted to the delivery of Scientology Introductory Services. These include the Personal Efficiency Course, an evening seminar providing fundamental Scientology principles applicable to everyday life and work. L. Ron Hubbard developed the Purification Programme to free individuals from the mental and spiritual damage caused by drugs. The Melbourne Church of Scientology’s Purification Centre pays homage to Victoria’s Twelve Apostles in a stained glass mural. As is traditional in all Churches of Scientology, an office of L. Ron Hubbard stands in honour of the Founder and symbolizes that this Church is true to his writings and ideals. 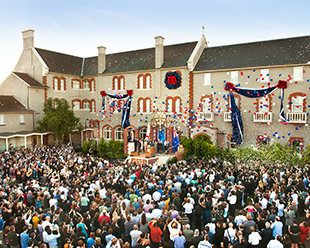 Thousands of Scientologists, dignitaries and guests from across the nation celebrated a milestone on January 29, 2011—the opening of the first Ideal Scientology Church in Australia. Auntie Joy Murphy Wandin, senior elder of the Wurundjeri people, opened the dedication with the traditional “Welcome to Country” ceremony, welcoming Scientologists to the lands of her ancestors. Scientologist, Melbourne native and award-winning singer and songwriter Kate Ceberano performed a moving rendition of her original composition “This Song is You,” written in honour of the occasion and the heritage of the city and all that Australia holds dear. Mr. David Miscavige, Chairman of the Board of Religious Technology Center and ecclesiastical leader of the Scientology religion, dedicated the new Church of Scientology of Melbourne. 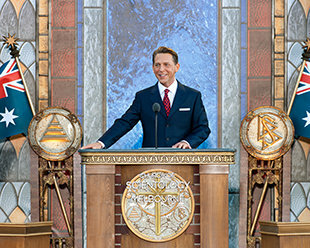 In tribute to the significance of the occasion Mr. David Miscavige, Chairman of the Board Religious Technology Center and ecclesiastical leader of the Scientology religion, travelled to Melbourne from the United States to officiate at the dedication. He acknowledged the long parade of accomplishments by Australian Scientologists that culminated in the new Church. “It is my honour to join you this evening and commemorate a moment that will live on in history for a long time to come. Not that you haven’t loomed large in history before, not that you haven’t triumphed over great adversity in years gone by, not that you didn’t stand firm for the dignity of Man, and not that you didn’t indeed uphold the God-given rights of all religions all over this world. Mr. Miscavige also spoke of Melbourne’s hallowed place in Scientology history, noting that Founder L. Ron Hubbard himself came to Melbourne in November 1959 to deliver a series of lectures to its founding Scientology community. As Mr. Miscavige explained: “Those November 1959 lectures marked a turn in the path and a rise in the road, from which the whole panorama of human potential came into focus. Whence, the highest levels of Scientology and the whole vista of spiritual enlightenment and freedom. The new Church of Scientology Melbourne Ideal Organization was dedicated January 29, 2011, in ceremonies attended by more than 2,000 Scientologists and their guests. Acknowledging the Church for its many contributions to the community were Melbourne Lord Mayor the Honourable Robert Doyle, Moonee Valley City Councillor Paul Giuliano, Shadow Minister for Tourism and Major Events, the Honourable Justin Madden, Sociology professor Gary Bouma and former Indigenous Person of the Year Uncle Bob Randall. Thousands of Scientologists and guests toured the new Church of Scientology of Melbourne. The fully restored estate includes Public Information Displays offering more than 450 information films and providing an introduction to every aspect of Dianetics and Scientology and the life and legacy of Founder L. Ron Hubbard. Melbourne has long held importance for the Scientology religion. Within months of L. Ron Hubbard authoring Dianetics: The Modern Science of Mental Health in 1950, the first Dianetics group in Australia was formed here and in 1955 the first Scientology Church in Australia opened in this city. Australia similarly long held a place near to L. Ron Hubbard’s heart, beginning with his service “Down Under” as a United States Naval Officer through the first days of World War II. Principally stationed in Brisbane, but also operating from Melbourne, then Lieutenant Hubbard was charged with organising relief efforts for Allied troops trapped in the Philippines. He also proudly served with Australian gunnery units for the defence of Brisbane. As Scientology Founder, L. Ron Hubbard returned to Australia in 1959 to deliver two historic lecture series: The Melbourne Congress and the 1st Melbourne Advanced Clinical Course. Remembered today for his delineation of the highest spans of the Scientology Bridge, Mr. Hubbard’s Australian lectures will forever hold a cherished place in the religion. Today, the Melbourne Scientology Church is the first Ideal Church of Scientology Organisation in Australia, realising Mr. Hubbard’s vision for what Scientology can provide for its congregation and community. The Church now stands on the site of the 19th century estate of Robert McCracken, leading businessman and founder of the legendary Essendon Bombers football team. After the turn of the 20th century, this building became the home of Mercy Teachers’ College, later part of the Catholic University. The original name of the estate is “Ailsa” for Ailsa Craig, an island off the west coast of Scotland from where the McCracken family sailed more than 150 years ago. Melbourne’s Public Information Centre offers more than 450 informational films illustrating Scientology beliefs, the life and legacy of Founder L. Ron Hubbard, and the full array of Church-sponsored social betterment and community outreach programs. The Chapel seats hundreds, the library contains all Church Scripture. Course rooms and counselling rooms accommodate Scientologists from throughout Victoria. Seminar rooms, film rooms and Life Improvement Course rooms make effective solutions to the most pressing challenges people face today easily available to Scientologists and non-Scientologists alike. Workspaces for volunteers stand open and ready for use by parishioners and the community.